Outside of the Cimarron River water was very scarce in southwestern Kansas and there was usually a charge for even a small amount. Mr. Rogers always gave his water free to passing travelers. Quite often he would hear a reply of "that's mighty Liberal of you" from the grateful recipients. By 1885, Mr. Rogers had opened a general store and the government established an official Post Office. It seemed only natural to call the new town Liberal. As the railroad extended its line through Seward County people became interested in the area and Liberal's growth began. In April1888, the plat for the present town site was created. In 8 days, 83 plank-constructed houses were built. Within a year, the population grew to 800. 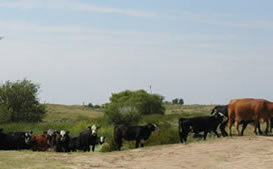 Drought and the opening of the Oklahoma Strip did much to decrease the population in a town whose economy was entirely dependent on crops and cattle. Although the population was low, the spirits of the remaining settlers were not. Always optimistic that something wonderful would come in the future, these hardy souls remained and made it through some of the worst years the state would see. Because of county seat difficulties between Springfield and Fargo Springs, the Rock Island deflected its route southward and really created the Town of Liberal. Originally the survey called for the railroad to leave Plains in Meade County and go through the center of Springfield in central Seward County and cross at the more accessible crossing of the Cimarron River. The townspeople of Springfield offended the construction crew and the road was changed to cross the Cimarron River at Arkalon. Upon reaching the end of the line, Mr. M.A. Low ordered the surveying of a new townsite a mile east of the Rogers place. He purchased part of 4 sections of land there for that purpose in the center of the present day Liberal, Kansas. The plot of the townsite of Liberal was opened April 13, 1888. During the following 24 hours, the sale of lots totaled $180,000 of which some $60,000 was paid in cash. Within a week there were 83 wooden constructed houses in Liberal. Within a year Liberal was incorporated as a 3rd class city. In the following years citizens moved their homes and businesses from Fargo Springs, Arkalon and Springfield to Liberal, which became the new county seat. In 1920, gas was discovered west of Liberal on what was to become the vast Hugoton Gas Field. The Hugoton Gas Field was the largest gas reserve in the world. In early 1951, oil was discovered southwest of Liberal. During exploration, 2 layers of gas production below the Hugoton Gas field were discovered, extending life expectancy of gas in this area into the next century. Those early settlers were right. Something wonderful was in the future, and still is. That optimistic, "can-do" attitude still exists, and it is this attitude that will carry Liberal into the 21st century preparing for and embracing new opportunities along the way. In 1890, the 1st City-owned wells were dug along Kansas Avenue. Pipes supplied the business section, but homes kept large barrels in front of the house which were filled twice a week for a fee of 50 cents per barrel. As a result of becoming the broom corn capital of the world and other successful farm ventures, some 500 buildings were erected in the years 1907 and 1908 alone. Consequently in 1909, a successful $45,000 waterworks bond was voted in. In 1911, a huge tank was erected along with a pipe system for the rest of the City at 7th and Grant. In 1917, 3 more wells and another huge standby-pipe was added to the water system. In 1899, Liberal installed its 1st City lights. They consisted of coal-oil lamps placed on street corners on 8-foot poles and were the pride of the City. Local people bragged about being able to read their mail under the street lights. In 1908, a few electric street lights were added into the business district but homes continues to use coal-oil or kerosene lamps at that time. The railroad is actually credited with keeping Liberal alive in the early years before 1900. Liberal started out as a boom town but similar to many places it lasted only a short time as hard cash was practically nonexistent. Many people became discouraged and left with many returning home or moving on to try their luck in the Oklahoma Panhandle. Those who stayed, however, achieved comfortable homes and many of them became moderately wealthy. The 400 hardy souls in Liberal in 1900, were the only ones standing between this City and the fate of half a dozen or so ghost towns that surrounded Liberal. Those 400 residents are the core of the prominent City we know today. Except for their faith in the future of this town and the railroad, this town could have experienced the same fate as those surrounding ghost towns. Seward County is primarily an agriculture and livestock county. Cattlemen were the 1st white settlers of this region, and while they were few in number, their cattle grazed over a vast area. Farmers tried raising Sorghum and cane when a sugar mill was being promoted. After the mill filed, they tried a watermelon seed project. There were 2 carloads of seeds were shipped to area farmers. While the project was a success in terms of the crop, the project failed because of a lack of a market. Some maize and kaffir corn was raised with some success in the early 1900s. Other crops that were tried were castor beans and broom corn. The beans grew well and brought good prices but proved to be poisonous to cattle. Broom corn proved to be very successful with many hundreds of acres being raised. Liberal was known as the broom corn capital of the world. More broom corn was grown, marketed, and handled here than in any other place known. Hard winter wheat came to Seward County from the eastern counties and by 1910 it had replaced broom corn as the major crop. Hard winter wheat could stand the hot dry weather and proved to be the best variety to mill into flour. With improvements from horse drawn to mechanization of machinery farms became larger. The Angell one-way plow revolutionized wheat growing in dry land Seward County. The discovery of deep well irrigation and the use of natural gas as a fuel made it possible to grow many kinds of crops. These include corn, milo, alfalfa, sugar beets, and wheat. Farmers are now able to produce all feeds necessary for the production of hogs and cattle.